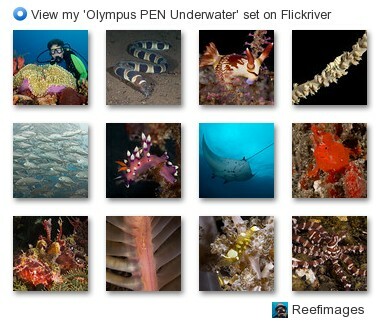 I get lots of questions from people on what camera set-up I use underwater. They think I should be using the top of the range Nikon, Canon or Hasselblad ..... But I don't! Actually I enjoy using a small, lightweight camera that has just enough features and quality for me to record high quality images of the underwater world. I stopped using my dSLR monster in May 2012 and have been taking photos since then with an Olympus PEN Micro Four Thirds camera (model: EPL2) in an Olympus PT-EP03 housing with Leica & Olympus Lenses. I use Zen dome & macro flat ports (glass). Inon Strobes and Locline arms. (And I don't get anything for free from Olympus, I just like their camera's!!) Check out some of my latest photos at my Flickriver Gallery. Hi Tracy my favorite lenses are the Leica 45mm for macro and the 9-18mm for wide angle. I don't know of any good housings for the EP3.